This English phrase means ここでタバコを吸いなさい (koko de tabako o suinasai)! It just so happens that I quit smoking last year, so I was a bit surprised when I saw this… Does JR Hokkaido want me to start smoking again??? You won’t find many signs with English phrases like this other than in Japan. 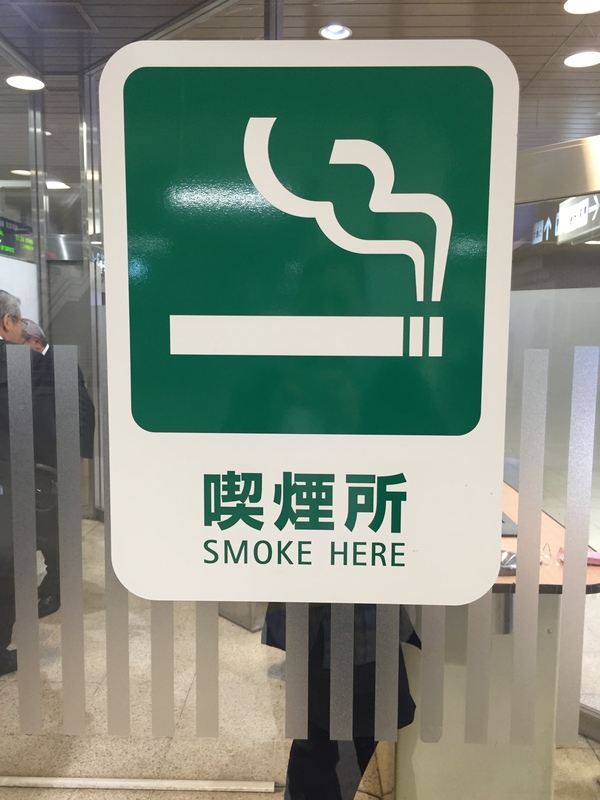 By the way, the verb “smoke” is used here in the imperative form, which isn’t a very friendly way to address your Hokkaido train passengers. By taking one-to-one private conversation lessons at Mike’s English Class Sapporo, you can learn about and practice speaking the kinds of sentences and phrases that are actually being used in English-speaking countries. Note: After this blog post became public and received coverage on a local Sapporo tv program called “Kyo-Doki,” JR Hokkaido replaced the sign with a pictogram sign containing no words. Although this solved the problem of using faulty English when you should have checked it first with someone who actually speaks the language, wordless pictograms such as JR Hokkaido’s replacement sign can be confusing and easily misinterpreted. The term ‘Smoking Lounge’ is used worldwide for such smoking booths and is readily understood by international travellers. 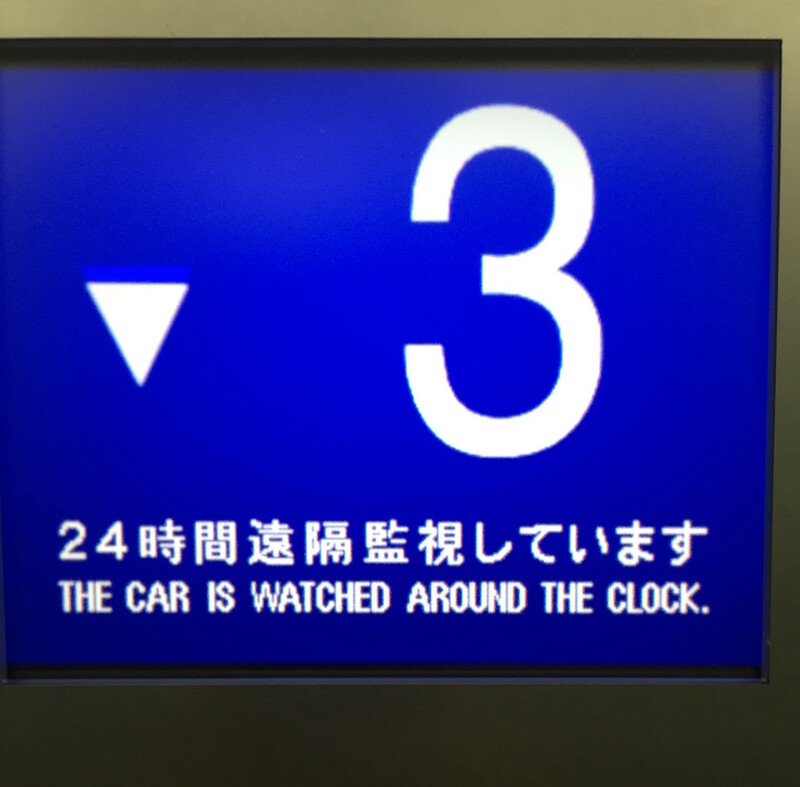 2 ‘Is watched’ is the passive form of the verb ‘to watch,’ so in Japanese it would be rendered as 誰かに見られている (dare ka ni mirareteiru). For example, ‘This TV show is watched by thousands and thousands of viewers.’ このテレビ番組は、何万人もの視聴者に見られている (kono terebi bangumi ha, nanmannin mo no sityousya ni mirareteiru). 3 The phrase “around the clock” means all day and all night, or twenty-four hours a day. Okay, then, how should one go about coming up with the appropriate English translation for the original Japanese sentence 24時間遠隔監視しています (nijyuuyojikann enkaku kanshi siteimasu)? Well, first you’ve got to nail the subject at the beginning of the sentence by using ‘this elevator,’ which refers to what you’re standing in at the moment. Then you can use the phrase ‘under 24-hour surveillance’ for 24時間遠隔監視. Finally, you can join these two phrases together with the singular form of to be, which is of course ‘is.’ Et voila!